- click on the button "MORE" in the lower right corner. - click on the button "Invite Friends"
- click on the button "My ID"
Sign in with Facebook or Twitter and hope that one of your friends follow your link. When it works you can also copy the link from Twitter or Facebook and send it via SMS, Email, WhatsApp and so on. 1. Go in nearby ... search for really low levels 28-45 add them as a friend. 2. after you borrowed your friends in dungeons you can also see low levels! Borrow them and add them as a friend. 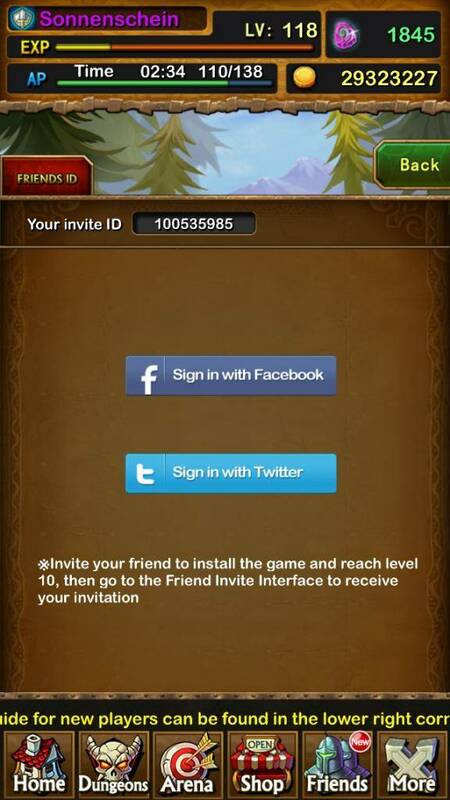 Please go to 'More', 'Invite Friends' and put my ID in the invite tab and receive a free Blod Elf Mage Card. My ID is: 100??? ?